In addition there was a metal and cloth breathing mask in a sealed plastic wrapper bearing a small white-on-black sticker which states: "A Factory Product - For your protection Xmas 79/80". We were aware that these existed when one was spotted by our roving reporter at Factory/Hacienda exhibition held at FAC 251 shortly after it opened. However, full details of the item have remained a mystery until now, thanks to Julian in New York who recently contacted us. 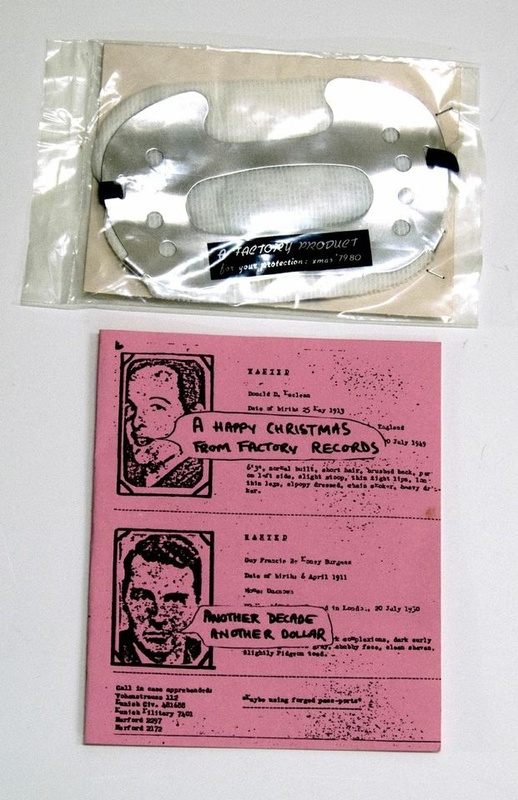 Masks were mailed out with a pink card with handwritten note by Tony Wilson. "It was mailed to Larry Ottoway (NE England DJ and promoter) in December 1979 and is in the original mailing envelope. My presumption was also that the safety mask was related to (or, essentially, a variant of) FACX 79. The black and silver 'Factory Products' label on the face mask is nearly identical to the label on the earplugs and of course the two products could easily have been purchased from the same industrial supplier. I was wondering if other examples of the card had surfaced. It shows an altered wanted poster of the spies Burgess & Maclean and is inscribed, by Tony Wilson, I assume, on the interior, 'Larry, Seasonal Cheers, The FACTORY'." Many thanks to Julian for the imagery and info.